NEW DELHI—India's scandal-plagued government lost hundreds of billions of dollars by selling coalfields to companies without competitive bidding, according to a leaked audit report that the auditor itself called misleading. Angry lawmakers blocked proceedings in Parliament on Thursday after the findings by India's Comptroller and Auditor General were printed by The Times of India newspaper. Outraged opposition party leaders demanded an explanation from Prime Minister Manmohan Singh of why about 155 coalfields were sold to select private and state-run companies without competitive bidding, resulting in an estimated loss of nearly US $210 billion. Prakash Javadekar, a spokesman of the opposition Bharatiya Janata Party, said the coal report is even more serious than the government's 2008 sale of 2G cellphone spectrum, also without competitive bidding. The cellphone sale, which auditors say cost India billions of dollars, has been among the government's most damaging scandals. The letter, released on Tuesday afternoon by Singh's office, cast the report's details as preliminary observances and said recent Coal Ministry clarifications “have changed our thinking.” It said the auditors have not concluded that the coalfield buyers' gains were equal to any losses in the government treasury. “The leak of the initial draft causes great embarrassment as the audit report is still under preparation. Such leakage causes very deep anguish,” the auditor said in the letter. Singh's government has been embarrassed repeatedly as senior ministers and officials faced corruption charges stemming from the hosting of the 2010 Commonwealth Games and the 2G cellphone spectrum sale. 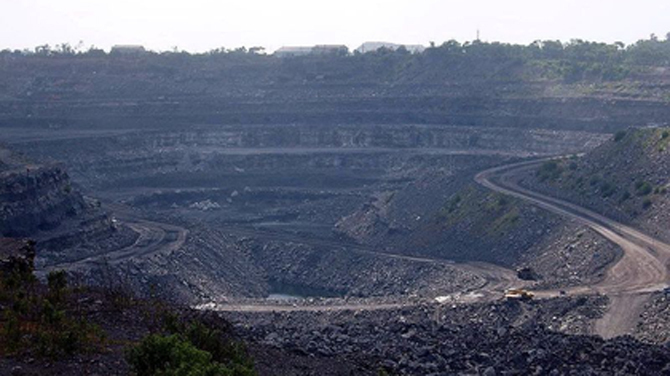 The auditor's draft report said the allocation of the coalfields between 2004 and 2009 had resulted in windfall gains of $97 billion for private companies. Coal Minister Sriprakash Jaiswal refused to respond to the leaked report. He said the government had followed a “transparent” policy of advertising for the allocation of the coal blocks. He said state governments were consulted and all responses to the advertisements were screened by a committee before they were sold. Opposition parties accused the government of causing massive losses to the country by not holding auctions and instead following an arbitrary policy of rewarding certain companies. “Such enormous largesse showered on profit-making private companies is nothing but a huge scam,” said Sitaram Yechury of the Communist Party of India (Marxist). “It is disturbing that these coal blocks were allocated at a time when the prime minister was in charge of the coal ministry,” he said. Coal, being a natural resource, cannot be gifted to private corporations at throwaway prices, opposition lawmakers said. “This is a government of scams,” said Gurudas Dasgupta, another lawmaker, who demanded that government recover the losses from the companies. The state auditor's report comes a year after the government was embroiled in the similar scandal over the sale of cellular operating licenses under a convoluted "first-come, first-served" process that netted the government 124 billion rupees ($2.7 billion). Some ineligible recipients of the licenses sold them at much higher prices than they had paid the government. The government lost nearly $36 billion in potential government revenue in those licensing sales in 2008, CAG reported.